Watching the US presidential coverage on the news always provides entertainment, especially considering how intense the democratic nomination was. While watching one of these segments they mentioned that Barack Obama had raised 100% of his campaign funding through online contributions. He has not accepted any campaign contributions from large companies or lobbyists. Instead, Barack Obama’s campaign has been one of the most profitable in history, with the majority of campaign contributions made online through over a million small contributions. In fact, Barack Obama has raised nearly $200 million online, with a record $55 million raised in February alone, or nearly $2 million per day. 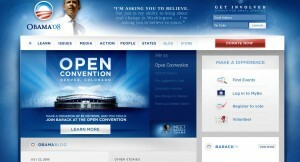 It was a Saturday night and I immediately jumped on my laptop and brought up www.barackobama.com. The next hour was just spent in admiration of the level of detail and expertise implemented by Barack Obama’s online marketing team. When you know what to look for in a good website and marketing campaign, you can really start to appreciate the level of skill behind his entire online marketing strategy. 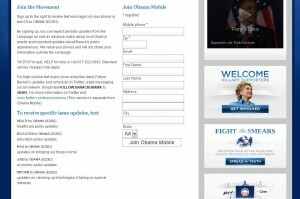 Notice how he makes it very easy to subscribe, only asking for your email address and zip code. Also notice that the main call to action button ‘learn more’ is in red. This is done to attract the eye to the primary action that he wants you to take on this page. Importantly, you do not have to subscribe to view the rest of his website, you can simply click on ‘skip signup’ to visit the main website – but this is not the focus. What’s impressive is the wording they use, such as ‘Join the movement’ and ‘this campaign is about you’. They are giving you reasons why you should fill out the form. So the first step was a small yes, just email and zip code. The next step is to enter your full name, address and phone number. If all of this information was asked of you on the first page, the response would be much lower. Remember, getting people to say ‘yes’ on a higher number of small commitments is better than asking them to say ‘yes’ on one large commitment. There are 3 main actions he wants you to take on the ‘thank you’ page. The most important, as we can tell from the red button, is to ‘donate now’ (which I will cover shortly). The others are to register to vote and to visit the home page. Every image on the page is a link, ensuring that a visitor will be taken to a different page no matter what they click. The site makes it very easy to act. Of course, once you subscribe you will start to receive high value emails from him driving you back to his website to take action. 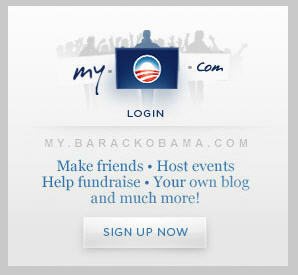 No matter what page you are visiting on the Barack Obama website, the red ‘donate now’ button draws your attention. It is essentially the only red image on a blue, grey and white website, which is a very subtle, yet powerful method of encouraging people to take the action. 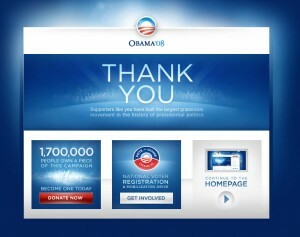 This is a landing page designed to compel the visitor to donate to the Obama campaign. When you visit the page a very short video automatically starts playing, with very relevant information which explains WHY you should donate to his campaign. By giving options for the donation amount, it makes it easy for people to make a decision on how much to donate. The website also pre-populates the fields with the information you entered on the previous page so that only minimum additional action is required of the person making the donation. The main call to action button is a red graphic, bringing attention to the action he wants you to take. Again, you have a ‘skip donation’ link at the top of the page in case you do not want to make a donation at the time. The online donation process is by far his most valuable ‘sales’ system on the website. The way that the information is laid out and presented makes it easy to use and, more importantly, to scan. Website visitors have the shortest attention span of any mode of communication, quickly jumping between pages and leaving sites where they cannot quickly find what they are looking for. A subscription box is included at the top right hand side of the page, to join the mailing list, and a picture of Barack Obama and inspiring quote is included to build instant credibility. Of course, the ‘donate now’ button is visible immediately, as well as additional actions which he wants you to take. All this happens BEFORE you start scrolling down the page. Every call-to-action on the site leads to a landing page which is setup to convert. 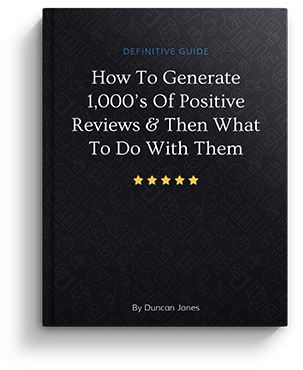 Posts are added to the blog multiple times per day to communicate with supporters on a daily basis as well as providing a channel for supporters who only consume news through RSS aggregator software such as Feeddemon or Bloglines. 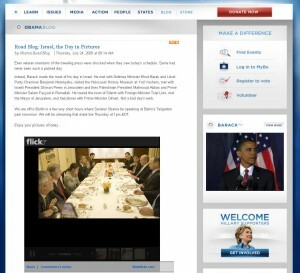 Blogs are one of the best methods of communicating and building relationships with people, and Obama is using his very effectively. Notice the integration of social bookmarking ‘quick links’ at the bottom of every blog post. One of the most impressive elements of Obama’s online marketing campaign is the reach achieved through social networking, which is one of the fastest growing and far reaching methods of online exposure available today. 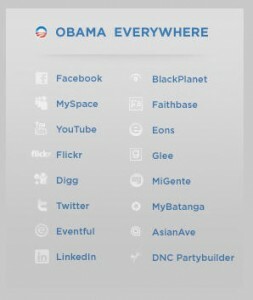 Barack Obama has an account with every high traffic social networking site on the Internet. More importantly, each of those accounts listed above are very active and drive traffic to the main website. This type of strategy is not for the faint hearted, and requires a significant amount of management to achieve the levels of success achieved by Barack Obama. Giving supporters a voice on his website is a masterstroke. Notice how you can select the SMS updates you want to receive. That way, you can keep up with the latest updates on the topics which matter to you. 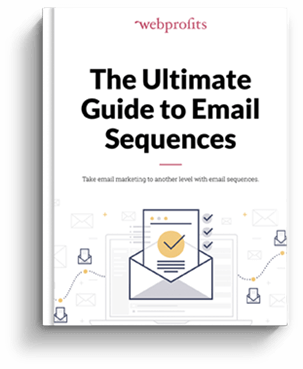 The best part about mobile marketing is that the deliverability is nearly 100%, that is, everybody opens a text message when they receive it. 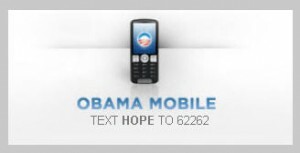 If you have ever wondered what a perfect online marketing campaign looks like, just look at the Barack Obama campaign. 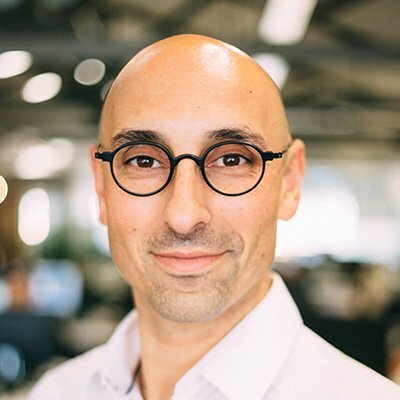 Their online marketing team are implementing every online marketing strategy available, including social networking, search engine optimisation, pay per click advertising, email marketing, mobile marketing and a number of other strategies. Not only that, but their implementation is flawless. 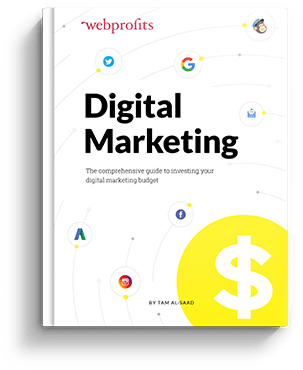 The cost of running an online marketing campaign like Barack Obama’s would be outside of the budget and resources of most companies, but we can learn a lot about any particular strategy which we are thinking about implementing. 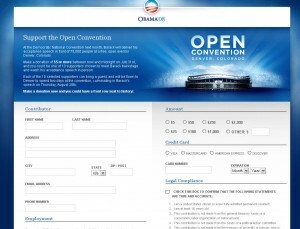 For example, if you are looking at ways to improve your website’s conversion rate, look at how the Obama website is designed. If you are looking at ways to implement social networking, check out the profile pages on MySpace or Facebook. Start thinking about how you can implement what I have just spoken about in this article on your own website and online marketing campaign. Wow… education in the cyber world we live in is so interesting and imperitive…almost ready to launch my company web site and this article has informed me of so many other marketing options. Thanks heaps to you guys and of course..Obama. Great article and great example of a very modern optimised site. Is there any advantage in using Flickr in e-commerce sites for product photos? Without a high converting website, your online marketing campaign will not produce results. Similarly, without driving traffic, your website will not have a chance to convert. With that in mind I recommend that you focus on designing a high converting website, and implementing ONE online marketing channel (eg. SEO, PPC, social networking etc.). Focus on getting that marketing channel profitable and then move on to the next. One thing this list leaves out — the PPC landing page that has been going strong for six months is excellent. It’s just a tad different that the cover page that makes your first screenshot. 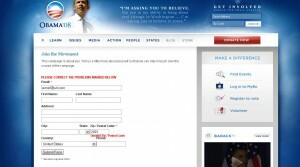 The Obama campaign took a tip from the PPC Affiliate Marketing community — well done. One nitpick: The Obama campaign has raised a lot of money (tens of millions) through tradidtional offline fundraising, particularly early in the campaign. This is so true, if you want to compete with the big guys you need to build up your resources with the best tools and hire the right people for the job. I love the fact that he’s on twitter too. 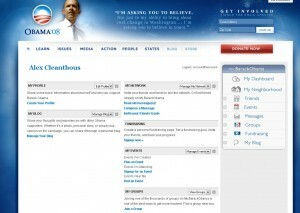 What a great review of Obamas site, and capturing all the subtletys, I like that. I too have been following Barack’s online strategy and have also been very impressed. They really have focused on flawless execution and I’m sure that their use of social media allowed the party to speak to an audience that they may not have been able to reach effectively otherwise. I can’t thank you enough for your generousity! I love the details in explaining the webb features. This is excellent info and breaks down everything into byte size pieces I can easily implement. By the time I finished reading the article and researching the Obama site I had 3 full pages of notes! I plan to take action immediately! This is an awesome real world example of how to integrate all areas of web design and development. Spot on! He / his advisors must have ligned up some serious IM and SEO talent. The website changed a bit, but I see your point. Excellent. Thank you for showing it to us. My question is about your view of the direction of virals. Is this a one-time phenomenon or will it linger? Reason I ask is that Wikipedia is seeing a sudden drop in editing/submissions and Miley Cyrus has just dropped out of Twitter. Is the world becoming too information overloaded?? Mr. President make very strong web marketing and their steps are really useful for us I am very thankful to you about this one it is really a fantastic information.This is one of the best step for us. Great post… he / his advisors must have ligned up some serious IM and SEO talent. Fantastic article. I had taken this site for granted and realized it was a good site but never thought about why it was so effective. Excellent analysis. This clever method of promoting his cause caught many off guard. He went from less likely to win to actually becoming president. Love or hate him one thing most will agree that he sold his self well, not to mention the historical amount of money he was ablest raise. Awesome! I think we can learn a lot from Barracks website. I will be putting some of these strategies to use on our websites. I really wouldn’t have thought that he he’d have such an effective online campaign – I’m amazed. Marketing strategy used to increase the sales in business.Customer satisfaction is the main goal of marketing strategy.Marketing strategies may differ depending on the unique situation of the individual business.